The Chancel Choir rehearses regularly on Tuesday nights from 7:00-9:00 PM and sings at the 10:00 AM service on Sundays, both in the Sanctuary and in our new Music and Multimedia Room. The Choir also sings at other seasonal worship services during Christmas and Holy Week and offers several Choir Concerts throughout the year for the church and surrounding community. Our Director of Music Ministries is Bailey Joy Myers, a very talented musician. If you would like to join the choir or have questions about our music ministries, please contact Bailey at baileyjoymyers@gmail.com. The Handbell Choir rehearses on Tuesdays from 6:00-7:00 PM. Under the direction of Emily Clough, talented floutist and musician, our handbell choir is growing and so is our collection of handbells, all donated in loving memory and/or thanksgiving. The Recorder Group rehearses at various times when they are playing during worship services or at a special community event. 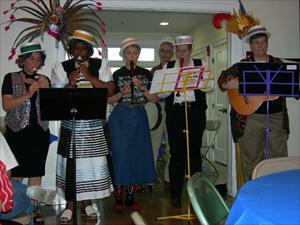 Under the direction of Maybelle Kagy, talented musician, the recorder group brings joy not only to Ascension Church but to many others as they do outreach with their music in venues outside of the church. ABOUT ONE OR SEVERAL OF OUR CHOIRS? We welcome new choir members and musicians! Ascension is blessed to have Karen Ashbrook, world known hammered dulcimer musician, composer, teacher, as a member of the church. Karen plays at the Healing Rite the first Sunday of the month, at special worship services, and on Thanksgiving and Christmas mornings. You may order Karen's CDs at http://karenashbrook.com. You will find yourself transported to a place of peace and tranquility, as you listen to her beautiful Celtic and Folk Music pieces. Ascension is also blessed to have Lisa Null, a songwriter and singer, who is a member of the Folklore Society of Greater Washington. Lisa has just put out her very first CD and is a regular performer at the Takoma Park Folk Festival. 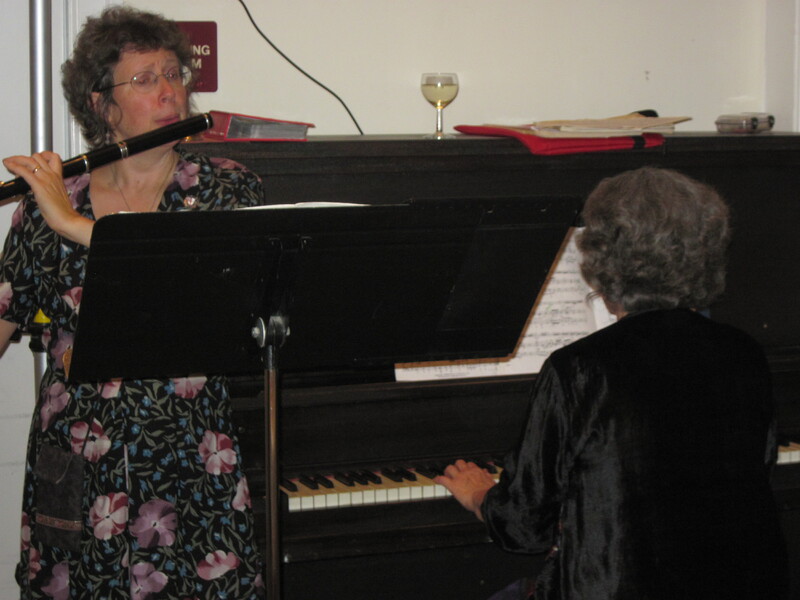 She and Karen often come together to offer music at worship services, especially on Christmas morning, Good Friday, and Easter Sunday. You will find yourself being inspired by the uniting of Lisa's voice and Karen's hammered dulcimer as you come to worship and praise God in the holiest of seasons and on the holiest of days. The Ascension Youth Choirs & Arts Program is an integrated arts initiative for the children of Church of the Ascension that combines religious education with choir, music, and theater arts. The program seeks to foster the love of God through music and theater and provide content which nourishes the intellect as well as the heart so that children's musical abilities and faith can flourish. Music andn arts are an essential part of the human experience and are especially important in a child's development. Exposure to music and the arts helps children increase academic skills, but more importantly, sustained participation in arts programs helps develop discipline, perseverance, reasoning skills and imagination. Cherub Choir: Directed by Denise Young. Denise is a creative director who knows how to bring the best out of our little ones musically. Not only does she help the children to thrive in their creative talents but she also makes the choir a fun place to be! Youth Choir: Directed by Bailey Joy Myers, our Director of Music Ministries, Bailey is a gifted musician, composer, director, and teacher. The Youth Choir seeks to foster the love of God through music. As a member of the choir, children will learn basic musical skills in rhythmic notation and sight singing, and apply these skills to songs and hymns from the Hymnal 1982 and other music resources. Music education has been shown to increase academic scores in subjects, such as math, while also encouraging collaboration and self-esteem. Youth Players: Directed by Shellie Williams, an arts professional, grew up in the community theater and has performed in musical productions in South Carolina, Michigan, Florida and Maryland. The Youth Players will use drama as a method for teaching children about the Episcopal Church and biblical stories. Drama workshops provide children with a safe environment in which to explore and question liturgy, ritual and Biblical history. The Youth Players will undertake one to two dramatic workshops and performance a year including a Christmas performance. In addition to its religious education aspects, drama workshops also help children with literacy skills, increased self confidence, presentation, listening and observational skills. and also sing as a combined choir on special occasions. A Highlight of the Year is the Children's Christmas Pageant. in fresh ways that contemporary Christians can enjoy.